Brussels, November 28, 2017: Ahead of World AIDS Day on December 1, a new report launched at the European Parliament today reveals that young people aged 10-24 remain underserved and overexposed to the risks of contracting HIV & AIDS, and other poverty-related diseases. The report calls on the EU to do more to help these young people – through education, public health interventions targeted at adolescents, more funds for research into vaccines, treatments, and diagnostic tools. AIDS remains the fourth leading cause of death among adolescents in African low- and middle-income countries (LMICs). Young women and girls are particularly at risk in high-burden countries; in sub-Saharan Africa alone, adolescent girls and young women represent 25% of new HIV infections. More than half of the world’s 1.8 billion young people aged 10–24 years grow up in countries where the burden of disease is huge, and the health consequences disastrous. The report identifies a number of areas where policy makers can act such as designing programmes to specifically target this age group, and education and skills training to better equip young people to protect themselves. It identifies research gaps that that need addressing by policy-makers; a significant increase in R&D investment, for new vaccines, diagnostics, and treatment options for HIV and other diseases is essential. According to the most recent data, the EU’s annual support for research funding totalled 125m USD, but the EU remains far off a WHO recommendation to spend 0.01% of GDP on global health innovation. 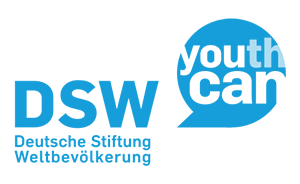 Deutsche Stiftung Weltbevölkerung (DSW) is a global development organisation that focuses on the needs and potential of the largest youth generation in history. We are committed to creating demand for and access to health information, services, supplies, and economic empowerment for youth. We achieve this by engaging in advocacy, capacity development, and reproductive health initiatives, so that young people are empowered to lead healthy and self-determined lives. With our headquarters in Hannover, Germany, DSW operates two liaison offices in Berlin and Brussels, as well as maintaining a strong presence in Ethiopia, Kenya, Tanzania, and Uganda. DSW also advocates for investment in research and innovation to fight poverty-related and neglected tropical diseases. Poverty-related and neglected diseases (PRNDs) are infectious diseases that disproportionately affect the world’s poorest populations. PRNDs include major diseases such as HIV&AIDS, tuberculosis (TB) and malaria, as well as a range of neglected tropical diseases (NTDs). In some definitions, the genotypes 4, 5 and 6 of hepatitis C and diarrheal diseases are also included. NTDs mostly comprise parasitic diseases such as hookworm, Chagas disease or schistosomiasis, but also viruses like dengue and chicungunya, and bacterial infections such as leprosy. An estimated 1 billion people are affected globally by PRNDs, causing the loss of 353 million years of healthy and productive life, and 6.5 million people die each year.